The Growing a Future Project has educated several hundred youth about sustainable agriculture. Over the period of our NCR-SARE Youth Educator Grant period the project expanded to cover all the elementary schools in DeKalb, Illinois and in Sycamore, Illinois; 14 elementary and middle schools in total. In addition the project transitioned into part of the larger DeKalb County Community Gardens. DeKalb County Community Gardens (DCCG) is a non-profit, formed in 2012, that manages over 15 acres of growing space. In two short years, DCCG has produced nearly ten tons of food that was donated to local food pantries, day care centers, schools, community meal locations, senior citizen centers and housing units, as well as to the meals on wheels program. DCCG has gardens all over the County, with over 200 raised beds as well as large acreages. The organization has created working partnerships with neighborhoods, schools, non-profit organizations, municipalities, County government, park districts, forest preserve district, businesses, hospitals, family health centers, foundations, and churches. DCCG is also working with Northern Illinois University and Kishwaukee College. DCCG has over 70 partnerships and sponsors. DCCG is also creating a community orchard and a food forest. DCCG is also working to establish the Northern Illinois Regional Food Hub and Processing Center. DCCG is also setting up seed libraries with local public libraries. Local Flavors dinners are also sponsored by DCCG. DCCG reaches hundreds in the County through the school and community programs, food donated, educational programs, seed saving and seed swapping events, local flavors dinners, and more. The lead of the Growing a Future Project, Dan Kenney, also founded and led the DeKalb County Community Gardens effort, which was launched in the spring of 2012. Thus, in addition to the 14 public schools, young people were taught sustainable agriculture methods in the high school through the student environmental group Eco-Buds. 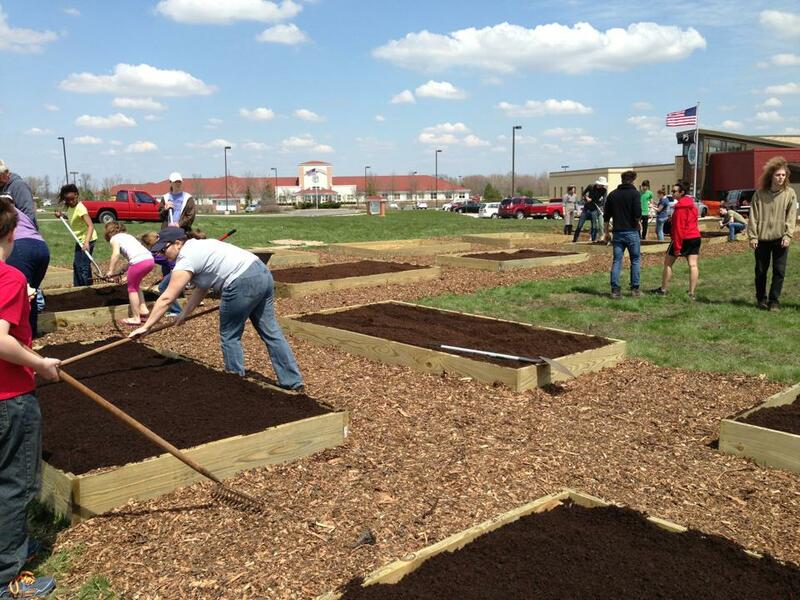 Also DCCG worked with the local alternative high school, Kishwaukee Education Consortium, and their culinary arts department to install gardens at the school. Here the sustainable agriculture methods were taught to the students who also were learning from using produce from the gardens in their classroom kitchen. DCCG with the Growing a Future project also worked with at Risk Students in partnership with the Youth Service Bureau. The students were paired with a sustainable agriculture educator from DCCG, with funds from the SARE Grant, and they were involved with the design, planting, stewardship, and harvesting of the garden. The produce from the garden was then donated to a local food pantry. The garden was located on a vacant city lot, owned by the city, behind city hall, and was named the “Mayor’s Community Garden.” The youth service bureau is located across the street from the garden. Gardens were also created at preschools in the DeKalb Community, so the young people experience sustainable growing methods from a very early age all the way through their educational careers. Also the DCCG, in partnership with the local YMCA, put in gardens on the YMCA property where youth in the Summer Day Camp can also learn sustainable agricultural methods during their summer learning experiences. All of the instruction is done with hands-on experiences. DCCG has conducted seed starting presentations in elementary, middle, and preschools. Also DCCG has launched seed libraries at two of the public libraries, which also involve workshops on seed saving, basic sustainable growing methods, etc. These workshops have been attended by youth of all ages, as well as by adults of various ages. Before receiving this grant I had a very limited experience with teaching youth about sustainable agriculture. The funds from the NCR-SARE Grant actually inspired and propelled me into a much larger project which broadened my understanding of sustainable agriculture and enabled me to dramatically increase the number of youth I involved in learning abut sustainable growing methods. In my work with middle school youth, who were at risk, I had installed gardens on the school grounds. I involved the youth in the planning, building, planting, and tending of the gardens at the middle school where I was teaching. I talked with them in a very limited way about types of seeds, organic methods verses non-organic, etc. We always used organic methods with our garden. Over time, thanks to this grant, my understanding of sustainable agriculture has greatly increased. Students will be exposed to and taught the three main goals of sustainable agriculture. Students will be taught the methods of composting through school based composting. 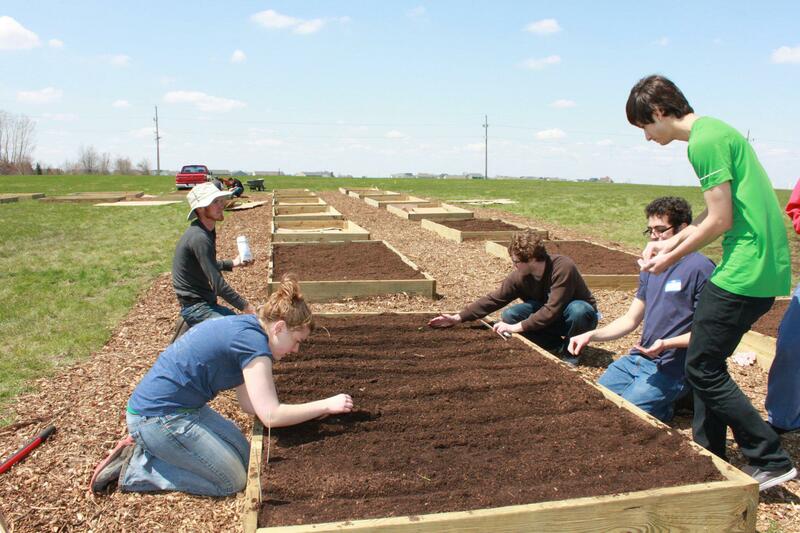 Students will be introduced to organic methods of raising crops. Students will be introduced to land ethics based on stewardship via their involvement in the four seasons of a Midwestern garden. Students will learn about economic profitability of sustainable agriculture through school based farmers’ markets. Students will learn about social equity through the produce they share with local pantries from their school/community gardens. We involved as many partners as possible to ensure the success of the program. The logic behind this is that the more collaboration there is between the school/ community gardens and the larger surrounding community the better. We involved the University Extension, food pantries, local regional food bank, civic organizations, community businesses, government entities, churches, and more. DCCG developed over 60 working partnerships thus far in the project. We involved people of all ages in the project. Again with the logic that the larger and more varied the number of participants the more likely you are to meet with success. We had volunteers from preschool up to age 90. We involved teachers, parents, and community people from a variety of backgrounds; this inclusion of so many provided varied learning experiences for all ages of youth, from kindergarten through college. We identified a point person at each of the schools and the other community locations. We then partnered the point person with a volunteer from DeKalb County Community Gardens. Then the two of them worked to create a garden team for their location. DCCG provided any needed back-up, including seeds, plants, volunteers, etc, depending upon the need. DCCG also secured additional funding from a variety of sources. Again, the logic is that the more varied the revenue stream, the more likely the project will succeed. Each garden site is also linked to the closest food pantry, so that there is a direct connection between the gardens and the food pantry clients. DCCG provides educational workshops for children and parents of a variety of ages in a variety of settings. Instruction is provided in the schools, parks, gardens, community centers, churches, and other locations. The DeKalb County Community Gardens: Growing a Future Project has had many people involved over the past two years. We have had well over 500 volunteers during that time, as well as over 60 partnerships, that include school and park districts, municipalities, businesses, social and health services, YMCA, and religious institutions. We worked with the University Extension on educational programs, tastings at food pantries, and created mentoring partnerships with gardeners from the Master Gardener program. We have involved the Soil and Water District in the planning of the five acre food forest we are starting on this season. We have involved local farmers in educational sessions with youth of all ages, as well as in community settings. We have involved parents with presentations to the PTA groups, as well as hands-on with the youth in the gardens. Also involved parents through our work with the food pantries, and our booths at local farmers’ markets. Also have involved adults of various ages through our educational programs on sustainable growing methods at the public libraries. The Growing a Future Project far surpassed our goals of teaching sustainable agricultural methods to youth. The project’s expansion beyond the original scope through the formation of DeKalb County Community Gardens, has allowed the project to reach hundreds of more youth, as the project now includes all of the elementary schools in DeKalb District 428 and in the Sycamore school district 427. Youth are also taught sustainable methods in two at-risk programs, as well as preschool centers. Our results are measured by the number of students who are directly engaged in the gardens. Also by tabulation of youth who are directly involved in gardens through the YMCA Day Camp program, alternative school settings, and in the preschools. We also keep a record of the audiences who attend our sustainable growing methods workshops held in various community locations as well as in the gardens. The Growing a Future project taught me much about sustainable agriculture, as well as how to share the information with others. I have learned much about soil, not just in our area of the country, but soil composition in general. I now realize that we run the danger in sustainable agriculture that conventional agriculture runs, which is bigger is not better, especially as it relates to the soil. I have even gone so far as to believe any use of tractors should be avoided. Especially where soil is susceptible to compaction, as our soil is in northern Illinois. I have come to respect the vibrant microbial life within the soil and that has affected my work as a grower and as an educator. I now try to impart this passion for the hidden life of soil to the youth I work with, and the adults. I find that it is just as eye-opening to them as it was to me. The fact that the project took on two large acreages at the same time we were deciding not to use tractors or tillers, continues to be a challenge. We have found the use of mulching to work, but is a struggle when dealing with so many acres, as we now span fifteen acres with over 250 raised beds. I am proud, however that we are accomplishing so much in such a short time. As I speak to civic groups, conferences, etc. I feel our methods and our struggle to be as sustainable as possible in our work to close the food gap, has also earned the respect of others. The trade association, America In Bloom, chose our school/community garden project as the most dynamic and successful in North America in 2013. I have presented to civic, church, youth, parents, and college classes about the work of DCCG. I presented at the NCR-SARE Farmers Forum at the National Small Farm Trade Show and Conference in Columbia, MO, as well as at the Good Food Festival in Chicago. I am going to present to the Illinois School Wellness Conference in Champaign on April 30th 2014. I have submitted a proposal to present at the 35th National Conference of the American Community Gardening Association in Chicago in August of 2014. In addition to newspaper articles and local magazine articles, I have also presented several times to the local university television station and appeared on their local news programs. I do not have any recommendations. I am grateful for the program. I think it provides valuable support to educating others about sustainable agriculture and methods. I am very grateful to the support of NCR-SARE, without it I doubt if I would have been able to turn Growing a Future into a County-wide effort.